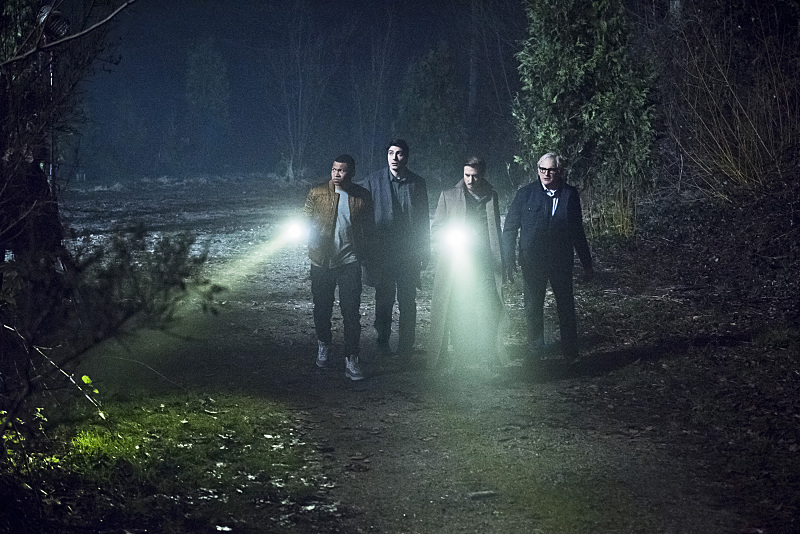 DC's Legends of Tomorrow -- "Leviathan"-- Image LGN113a_0400b.jpg -- Pictured (L-R): Franz Drameh as Jefferson "Jax" Jackson, Brandon Routh as Ray Palmer/Atom, Arthur Darvill as Rip Hunter and Victor Garber as Professor Martin Stein -- Photo: Dean Buscher/The CW -- ÃÂ© 2016 The CW Network, LLC. All Rights Reserved. We are in London 2166 where the only person speaking with a British accent is Rip. We also get a giant robot that looks straight out of Tron and Vandal Savage has a daughter! As soon as our Legends arrive in 2166 they are attacked by Savage’s forces. The team manage to find a safe place to land and we learn that we are three days away from Rip’s wife and son are to be killed. The team go to a rally where Savage is speaking in order to capture him. This rally was filmed at Vancouver’s Robson Square where in the winter has a public skating rink. In the crowd is Rip, Sara, Snart and Rory. Savage speech concludes and he makes his way. The woman (Jessica Sipos) that had been by the side of Savage walks behind him and makes Snart. Snart sees this as a bad sign but Rip wants to stay the course and he, Sara, Snart and Rory follow Savage out. But Snart and Rory takes matters into their own hands and make a play for Savage. Of course things don’t go their way and they have to retreat. However, some good came out of the debacle and that is Kendra, on the Waverider, notices that Savage’s lieutenant is wearing the bracelet that was present during her first death. Rip tasks Sara to help Kendra weaponize the bracelet but Sara has no clue how to do that. Rip also suggests that Kendra look over Adlous’ journals again to see what she can find. Kendra thinks it is hopeless as she’s poured over the journals a million times. As Sara and Kendra try to find something to help them weaponize the bracelet, Kendra finds Carter’s mace and Sara wonders if she still thinks about him. Kendra says she tries not to and that Carter is her past and Ray is her future. Sara notes that it is hard to get over a 4000-year old relationship. As soon as Kendra touches the mace, she has a flashback of her life in 1941 Iowa City. We see Carter, shirtless and all, training with his mace. Kendra arrives mad and Carter realizes he has forgotten their anniversary in this lifetime. Kendra forgives him and is surprised that Carter is gifting her with his mace and he tells her that it is time she learned to use it. DC’s Legends of Tomorrow — “Leviathan”– Image LGN113a_0007b.jpg — Pictured (L-R): Arthur Darvill as Rip Hunter and Brandon Routh as Ray Palmer/Atom — Photo: Dean Buscher/The CW — ÃÂ© 2016 The CW Network, LLC. All Rights Reserved. Rip, Stein, Jax and Ray go to a refugee camp and meet with the rebel leader (Sharon Taylor). Fun Fact: Sharon Taylor played Faora during Smallville’s seventh season. The team sees the conditions of the camp and Stein and Jax are particularly moved when they see displaced children and they want to do all they can do to help. Ray wonders to Rip why he doesn’t just whisk his family to safety. Rip says he as tried numerous times in the past but each time, Savage just finds a way to kill them. Rip concludes that time and the universe just wants it to happen. The rebel leader comes to them to say she has no clue who Rip is and that Ray and the others have been missing for 150 years but Rip insists they are here to help them defeat Savage. They then learn of an attack at another camp and when they arrive they see that everyone is dead. Stein and Ray are tasked to see what sort of weapon attacked the camp to see if they can counter it. The two learn that the weapon is actually a giant robot called Leviathan. Stein, Ray and Jax bring the refugees on board to keep them safe from Leviathan. Meanwhile, Snart and Rory is tasked to steal the bracelet. Sara jokes that their plan is to walk into Savage’s citadel and just steal it off the woman’s wrist but that is actually their plan. So Snart and Rory enter the Citadel shortly after we see the woman in a training session with Savage’s men. Rory jokes that he wants the bracelet because it goes with his outfit. The woman isn’t afraid of Snart and Rory and in fact knows who they are. This spooks Snart and he kidnaps the woman. In the brig, we learn the woman is Savage’s daughter, Cassandra and Savage has taught her all about the Legends. Snart talks about how she and him have bad fathers. Cassandra doesn’t believe that her father is bad and in fact believe he is some sort of hero because he was a victim of Per Degaton’s Armageddon virus, which claimed her mother’s life. However, if you’ve seen “Progeny” we know that it was Savage that was responsible. Snart takes Cassandra through the ship to see the refugees and how they are the victims of Savage. Cassandra is not moved until she sees video of her father ordering the development and use of the Armageddon virus. This seems to have turned Cassandra to the side of our heroes. There is definitely a flirty air between these two. Thanks to Rory, Kendra has melted the bracelet to coat Carter’s mace. Leviathan arrives and grabs the Waverider with its hands and flings it away. The Waverider is badly damaged but the team does have one hour before Leviathan comes back. During the attack Stein is gravely injured and taken the med bay but after everything is over, he will be okay. Before they split up, Ray and Kendra can’t believe that this is their life but they don’t say goodbye to each other. So Ray rigs his Atom suit to actually grow and once grown confronts Leviathan with a lot of encouragement from Jax. The battle is pretty cool but Ray gets the upper hand when he rips Leviathan’s head off. At Savage’s Citadel, he is pleased to learn that Cassandra has escaped but when he sees the bracelet missing, he knows that his daughter has been turned and calls out the Legends. Savage senses Kendra’s presence and she grabs him where the two battle it out. Snart, Rory, Rip, Sara and Cassandra battle Savage’s men and Cassandra even saves Snart. Later, Snart brings Cassandra to the rebel camp where she will prove to be a valuable resource in taking down Savage’s network. Thanks to the coated mace, Kendra is able to deal some significant blows to Savage. But one of Savage’s men comes to his defense. When Kendra takes him down, she removes his mask and it is Carter! Savage tells Kendra that when he found him, he had no knowledge of his past lives and used that to his advantage to lock his memories. Kendra is enraged at Savage for brainwashing her love and is about to kill him. Savage tells Kendra that if she kills him, she won’t know how to unlock Carter’s mind. Rip arrives and wants Kendra to kill Savage in order to save his family but she doesn’t as she wants to save Carter and get him back. So instead the team brings Savage on board and throw him into the brig. Back on the Waverider, Kendra tells Ray that they need to talk. This isn’t good news for their relationship as throughout this season, Kendra has been remembering her love for Carter. Meanwhile, Rip and Savage have their talk.